As any entrepreneur will attest, owning and running a small business is full of challenges. Finding funding and technical help, not surprisingly, are probably the two biggest headaches startups will face. It was no different for owner and operator of Yawd Seasoning, Omare Bradshaw of Kingston. After launching in 2015, Bradshaw’s prime focus was on manufacturing and distributing specially blended Jamaican powdered seasonings. His process involves grinding, blending and packaging seasonings for jerk, curries and other Jamaican dishes. 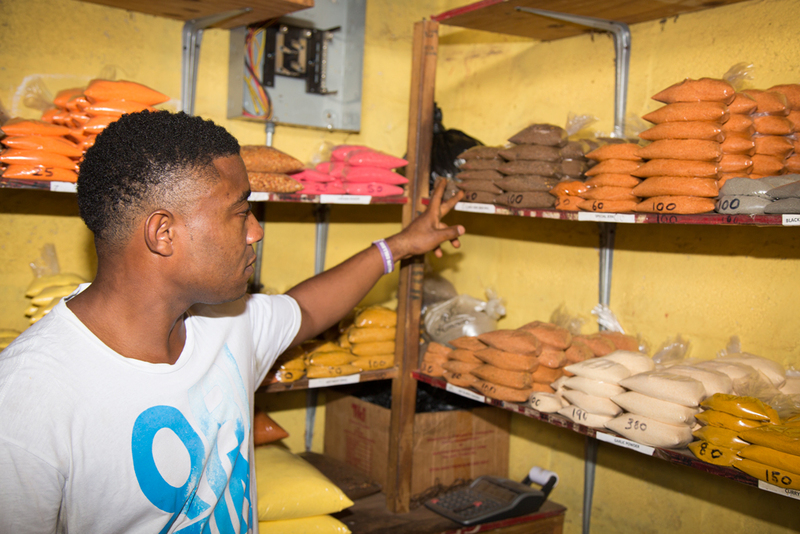 In his modest storefront at Coronation Market in Downtown Kingston, an array of colourful seasonings seem ready to light up any Jamaican dish. His clientele includes dancehall artists, restaurants, schools and small-scale cooks, and even the iconic Jamaican businessman Michael Lee Chin. Bradshaw explains that support from a cousin helped him launch his business. But once he got going, he realized he needed further financing for raw materials, inventory, packaging, storage and help. A friend advised him to seek assistance from the Development Bank of Jamaica. Last August 2017, he secured a DBJ loan and partial guarantee through its Credit Enhancement Facility (CEF). DBJ’s CEF is a partial guarantee helps small and medium-sized enterprises (SMEs) without the necessary collateral to access loans from financial institutions by guaranteeing up to J$15M of their loans. That loan and partial guarantee support has enabled Bradshaw to build the capacity of the operation, employ two new workers and import what he needs that is not available locally. According to Bradshaw, the DBJ helped him move from a bare booth to having seasonings of over 10 varieties lining his shelves. He also holds an import license and has seen the business grow at a reasonable pace. Bradshaw’s seasonings are truly special. While most of his efforts are focused on managing the blending technique to ensure consistent colour and grade, he says mixing seasonings is also an art. “That’s what makes my product special,” says Bradshaw. His mornings start as early as 3:30 am when he prepares himself to catch early market shoppers. He then leaves for his factory on Regent Street to start his processes for the next day. The larger bags of seasoning are sent to Coronation Market for weighing and packaging. Curiously, he keeps photos on his mobile of his bare shelf beginnings to remind himself of how far his business has advanced. He expects that one day soon when he is ready to export that he will need DBJ’s help and guidance again. “They understand the small businessman,” says Bradshaw.